Rapha Dark Grey Winter Base Layer Long Sleeve. Size XXS. BNWT. 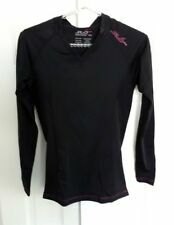 Rapha Dark GreyWinter Base Layer Long Sleeve. From Rapha NB: The Pro Team Base Layer sizing is race-tight. BASE LAYER! 94% polyester. 86% polyester. Machine wash cool 40C. 14% elastane. Do not bleach. Show that Aussie Spirit and Join World Bicycle Relief to Make a World of Difference. Tuckable-length drop tail. 8” zipper for venting. UPF 30 Sun Protection. Note: Sizing runs small, you may require a larger size than you would usually order. 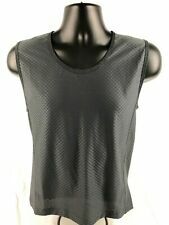 SANTINI CARBON 2.0 VEST Half-sleeve base layer made of Resistex� Carbon fiber infused fabric. The carbon thread absorbs and dissolves the electric charges and accelerates the process of evaporation of moisture by increasing the feeling of well-being. 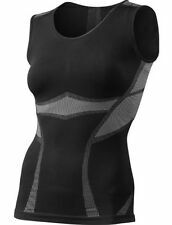 Half-sleeve base layer made of Resistex� Carbon fiber infused fabric. It has a differentiated structure, with areas with a higher concentration of carbon to further decrease the moisture in contact with the skin. Size : Medium/Large. Size : Medium/Large. Seamless construction with carbon fiber, anti-allergic, anti-odor and anti-UV properties. You can ’t go wrong with Pearl iZUMi cycling apparel. Before there was PEARL iZUMi, there was a man and a bike. The year: 1950. And in fourteen short years, he’d go form lugging clothing on a bike to redefining what every cyclist wore on them. Show that Aussie Spirit and Join World Bicycle Relief to Make a World of Difference. Cycling specific fit with rotated sleeve construction. World Bicycle Relief accomplishes its mission by distributing specially designed, high-quality bicycles through philanthropic and social enterprise programs. 55% OFF RETAIL La Sportiva MEN LARGE Minimal Jacket Light cycle hike climb NEW! And 1% for the Planet donations we make. • Zippered reflective pocket on the back. • Comfortable flatlock seam technology on all seams. • Integrated thumbholes. The science behind it is pretty simple. And furthering this, the Engineered Tech Layer features a seamless construction that increases comfort by eliminating seam-induced chafing throughout the base layer. Developed for devoted athletes. Intensity level: High. Fit: Tight. Rec temp range: –5 ºC to 10 ºC. Long-sleeve round neck SuperLight Carbon Underwear designed for the hot season, when suffocating heat and humidity give no respite. The result is a pleasant sensation of dryness and freshness on the skin provided by our SuperLight Carbon Underwear® fabric (36% lighter than Carbon Underwear®).